Certified kennel, AKC registered, pedigree, health certified? None of the above. Deluxemaltesehome.com is just another pet scam. Deluxemaltesehome.com are criminals. Their goal is to steal your money. 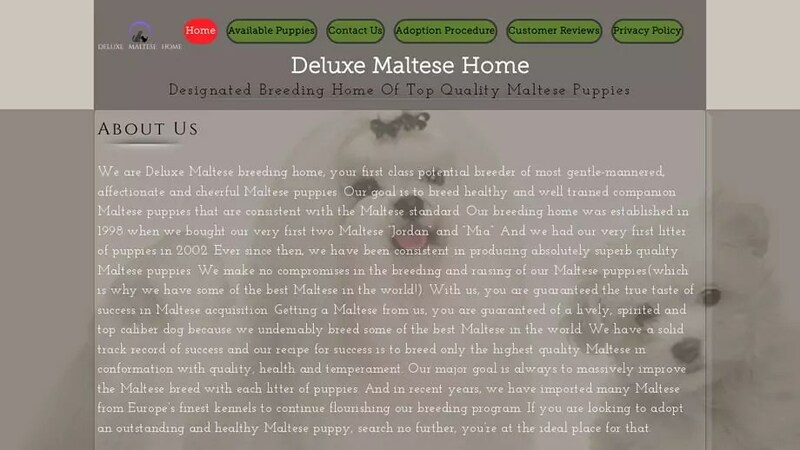 These scammers offer huge discounts that no actual maltese puppy breeder would ever offer.If you see an offer that is too good to be true, it probably is. After you have paid the (hugely discounted) initial fee for the puppy you will be introduced to the “shipping company”. To see more scam websites involving maltese puppys have a look at Maltese Puppy Scams. Deluxemaltesehome.com was registered on March 3, 2019 with Wix.Com Ltd. .
Deluxemaltesehome.com was registered using the email address deluxemaltesehome.com@wix-domains.com. It was registered 1 month and 9 days ago on March 3, 2019 and expires March 3, 2020. To look at it another way, this “company” only started March 3, 2019 and does not plan to be using the website after March 3, 2020 as it has only a 1 year registration. Deluxemaltesehome.com was registered with the domain registrar Wix.Com Ltd..
Wix.Com Ltd. have an email especially for domains that break their terms and conditions. Setting up a website with the sole intention of stealing money is definitely against Wix.Com Ltd.s Terms and Conditions! To send an abuse report to Wix.Com Ltd. please click the red button below and complete the email to help shut down Deluxemaltesehome.com! I’m sad! I was so excited. Then they mentioned only being paid with eBay gift cards. That’s when I searched & found this. Ugh! I had sent an inquiry to these people. Within minutes i got a text from number 210-739-0392 asking me to check my email regarding the puppy I was inquiring about. Once they stated that they only accept payment via gift card i knew it was a possible scam. I inquired about having someone get the dog personally before any money was exchanged and this person “Harry” was making up excuses. Lots of red flags.